Celebrate the birth of your baby boy or girl with handmade cigars from one of the most legendary families in the cigar industry ~ Arturo Fuente! These mild It's a Boy and It's a Girl cigars are traditional coronas (5 1/2" x 42) made in the Dominican Republic with a mild blend of premium Dominican short-filler tobaccos wrapped in Cameroon leaf. "It's a Boy!" and "It's a Girl!" are printed on the cellophane wrapper of each enjoyable cigar. 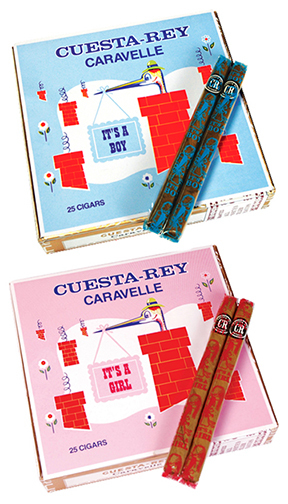 Cuesta-Rey Caravelle It's a Boy and It's a Girl cigars are machine made by the renowned J. C. Newman Cigar Company in the Dominican Republic. These mild to medium-bodied cigars are blended with quality Dominican tobaccos wrapped in a Connecticut leaf and offer a pleasant and mild taste that is not overwhelming. 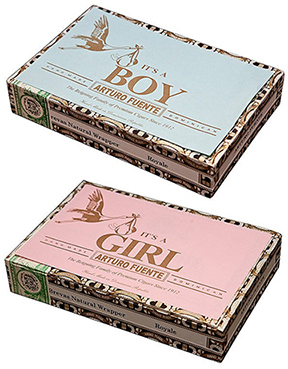 The perfect cigars to hand out to large numbers of family and friends to celebrate the birth of your baby boy or girl, the 6 1/4" x 34 panatelas are wrapped in cellophane imprinted with "It's a Boy" and "It's a Girl" and the obligatory storks carrying little bundles of joy. Share only the finest cigars on this momentous occasion with Davidoff of Geneva's Signature Series 2000 Tubo cigars! The tobaccos used for the Signature Series 2000 It's a Boy and It's a Girl cigars have been cultivated in accordance with the most ancient traditions, in the richest soils and ideal climatic conditions of carefully selected fields. The choicest leaves from various harvests undergo four years of aging, which imparts to the cigars a rich aroma and consistently smooth taste. Handmade in the Dominican Republic, Signature Series 2000 cigars are distinguished by exquisitely balanced taste and mild flavor. The petite coronas (5" x 43) are beautifully presented in aluminum tubes with "It's a Boy!" and "It's a Girl!" imprinted on the front.